Just like last year, January was #DatingSiMonth. This is a part of the Community Game-Along that Chic-Pixel has put on for the past four years! I sort of participated throughout the year last year, but got sidetracked by real life. This year, I'm hoping to be able to participate more. And starting up in January with Dating Sims always gets me in the mood to continue. Because, really, how can you go wrong with Dating Sims, right? I ended up playing a combination of Sweet Fuse, Seduce Me 2, and Men of Yoshiwara: Ohgiya throughout the month. I totaled only six hours of Dating Sims, but compared to the amount of time I've spent gaming and how my time has been alloted, I don't think that's too shabby. As a part of #DatingSiMonth, I decided to put together a stream on a whim, especially since I wanted to see if streaming was something I'd be interested in doing if I got enough Patreon support to reach my goal. I had a lot of fun doing it, but it's definitely something that's draining, and not something I could do consistently without some sort of motivation. I played two hours worth of Matthew's route in Seduce Me 2: The Demon War. I plan to continue streaming this route, at least in February. 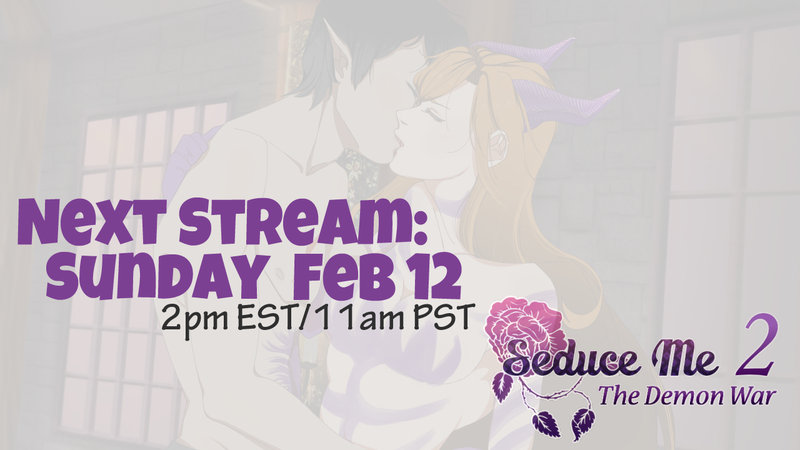 I had initially decided February was going to be the first time I'd stream, but then put one together in January just because. Initially I chose February for a plethora of reasons: Valentine's Day means it's fun to play Dating Sims (not that I ever need an excuse! ), and mainly I needed a distraction around the 13th of February for some personal reasons. I figured if I was joking with friends and having fun being raunchy about pixelated men, it'd be a fantastic distraction! 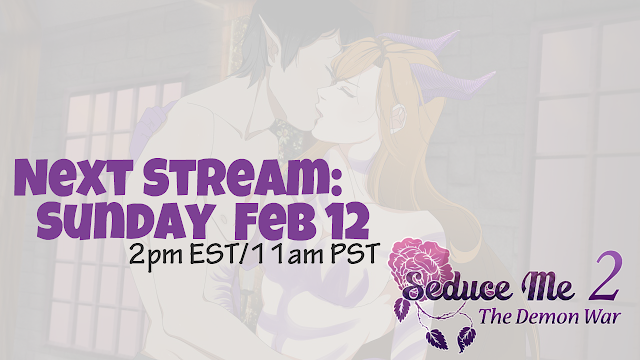 So, if you're interested in watching me play more of Matthew's route, join me on my Twitch channel in February! No guarantees about future streams unless Patreon works out, but keep an eye on my twitter for last minute streams when I feel like it.